Looking for a great place to hold your next wedding reception, birthday party, family reunion, anniversary party, bridal or wedding shower, business meeting, or any other special event? 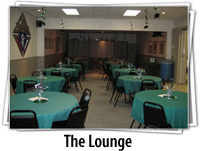 Try our Main Banquet Hall or Lounge. 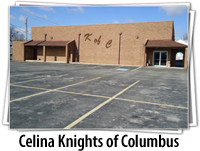 Whether you have a limited budget or are looking to have an extravagant event, our staff at the Celina Knights of Columbus can accommodate your budget needs. 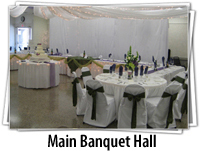 Our hall is located only a few blocks away from the scenic Grand Lake St. Marys, making it a convenient place to have your special event without having to drive a long distance to get great pictures for your event. Our improved Main Banquet hall is now larger; it seats 300 guests, includes a stage area for a D.J. and/or live band, and room for a dance floor area. The entire hall is wi-fi and handicap accessible. 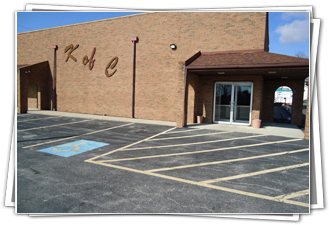 We also have ample parking to accommodate your guest's vehicles. If you’re looking to rent our Main Banquet Hall or Lounge, please check out our event calendar to ensure the desired rental date is available for your special event. For more information, feel free to contact us at (419) 586-2713 or simply use our contact form.